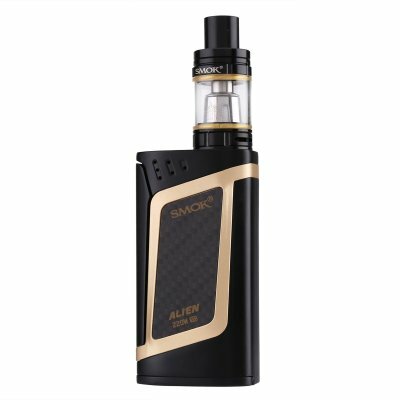 Successfully Added Smok Ailen Vape Kit - 220Watt, TC + VW Modes, Baby Beast Sub-Ohm Tank, OLED Screen to your Shopping Cart. The Smok Ailen kit consists of a powerful 220 Watt box mod that takes two 18650 batteries, and the stunning Baby Beast sub-ohm tank that comes with a Q2 0.4-ohm dual coil (Pre-installed and an extra T8 core 0.15-ohm octuple coil. You also get all the usual extras and spare parts, replacement tube and user manual. Adjustable airflow intakes on the base of the tank provide ample draw and the numerous available coils for the TFV8 Baby Beast ensures there is an option for everybody, so you can enjoy deep rich vapor clouds and a silky smooth taste. The design and features are nothing short of stunning and certainly help this box mod vape kit stand out from the crowd. Take for example the firing bar, it runs the length of the mod and makes it really easy to us, but to avoid accidental firing it requires a decent firm pressure to activate. Another feature that we found awesome was the ease with which you can fill the Baby Beast tank. Rather than unscrewing the top you just simply push down on the top cap and move it counterclockwise. The action of this hinged swivel cap is so smooth and simple it makes for mess-free refilling and yet it is so well designed it won't open accidently and spill when in your bag or pocket. Unlike many other kits, the Alien has a large OLED screen, (it even comes with a screen protector) that displays wattage battery power, current, puff count and a ton of other useful info. The fact that it can display all this data at the same time means you don't have to scroll through a long list of options and a casual glance is enough to keep you informed. Beneath this large display are two slightly raised trapezoid shaped buttons for adjusting all your settings and calling up the vape data. This Smok mod vape kit has a multitude of safety features such as short-circuit, reverse battery, weak battery, and high battery voltage protection as well as low atomizer resistance, high atomizer resistance, system overheating protection, and low e-liquid protection, all of which is fairly damned impressive. With its aesthetically pleasing styling and outstanding performance the Smok Ailen 220W mod box is a solid vape kit that will bring you countless hours of enjoyable vaping. The Smok Ailen box mod vape kit comes with 12 months warranty, brought to you by the leader in electronic devices as well as wholesale vape kits..